Decks, by the deck expert. Decks of various hardwoods, like Ipe, Mangaris, Cumaru and others have become very popular and have some definite advantages. They don't need to be sealed, but look great when they are. They are so dense that termites don't have a chance and most are fire resistant. They have no knots, so are a good value, being a bit more expensive than construction heart redwood, which has a good deal of knots and being less expensive than clear heart redwood, while being low maintenance and long-lasting. They sometimes cup (warp up), particularly on the ends requiring sanding after the first year. Ipe' has gone up in price, while Mangaris has stayed the same, so most of our recent wood decks have been done with Mangaris, which also has a Class A fire rating. But if you like low maintenece, a composite may be the way to go. First is the on-grade deck, which is usually under 37" off the ground, and these usually don't need permits and can be built up to the property line, in most cities. These make good do it yourself projects, but still they can be very detailed and can have many levels and built-ins, like benches and lighting. Second is the raised deck, which is over 37" off the ground at any point. It needs to have a 42" railing and does need to be permitted. Even a repair over $500 in Los Angeles City, and most of the cities around require a permit just for the repair. If it is deteriorating and needs to be rebuilt, LA City and most other cities around consider it new construction, and must be permitted and usually requires engineering. To see many more deck pictures, see our Decks page. For data on Trex and composite decks, see Trex decks. For deck refinishing, see our deck refinishing page. See a Slide show of 100+ decks patio covers, gates and fences! See a Mangaris Deck Video. Ipe deck in Sherman Oaks. Ipe deck in Beverly Hills. Mangaris deck Hollywood Hills Gazebo in San Marino. 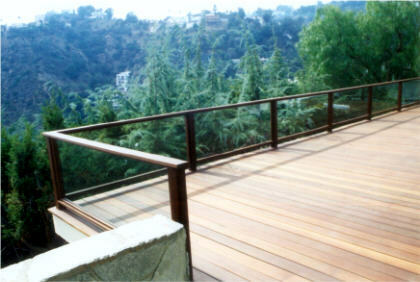 Ipe deck in Encino. Trellis structure in Glendale. Trex deck in Tujunga. Trex deck in Pasadena. Trex deck in Los Angeles. Clear redwood deck in Malibu. Trex deck in La Canada. Trellis structure in Studio City. Paneled fence in Tarzana. Trex deck in Brentwood. Arbor structure in Arcadia. Weather Best deck, Glendale. Paneled fence in Pasadena. Fence in Pacific Palisades. Solar Patio Cover, San Dimas. Solar Patio Cover in Monrovia. Solar Patio Cover, La Crescenta. 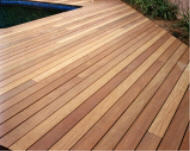 Ipe deck in Brentwood, (below).